Is it a piece of art, or a groundbreaking water experiment in the desert? Take the design of a leaf  natures master at absorbing the suns energy  and cover its 200 square meter (2,153 square feet) surface with solar cells. Under the face of the elm leaf-shape structure are cooling condensers that soak up humidity from the desert air. Even in the hottest conditions, it will produce a layer of ice on the leafs ridged underside  so the theory goes. Ap Verheggens vision of creating a glacier in the desert is a statement. Its not meant to solve the worlds ever-worsening water problems, but to demonstrate, as he says, that the seemingly impossible is indeed possible. For the Dutch artist, his sculpture will be a cry of alarm at the rapid pace of global warming. Impractical in itself, it is meant to spur others to strive for innovative responses to the evolving circumstances of changing climates. I give inspiration. What you can do with it is up to others, he says. Verheggens giant sculpture is so far only a sketch and a series of charts in a laboratory in Zoetermeer, near his home in The Hague. Cofely, a refrigeration company that makes ice rinks and custom-designed cooling units for food storage, is testing the principles of creating ice in desert conditions. Tests should be concluded by next year, then the task of sculpting the massive work will begin, said Verheggen. An unidentified north African country will be the first to host it. The company is using off-the-shelf technology. Everybody thinks its dry in the desert, but its roughly the same amount of moisture in the air as here, said project manager Erik Hoogendoorn. 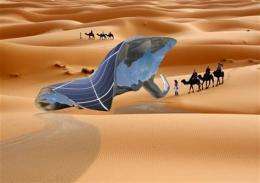 Its unlikely the idea will be developed anytime soon on an industrial scale to bring water to arid areas for human or agricultural use. But Verheggens work will carry symbolic importance, says Szollosi-Nagi, the rector of the UNESCO Institute for Water Education, an arm of the U.N. Educational, Scientific and Cultural Organization. The institute, which brings students from developing countries to study water issues, will use the work on its website and in promotional movies, he said. We are not good at conveying simple messages in a powerful way. Science has its own limits, beyond which art can go, he said at his office in the nearby city of Delft. The project demonstrates that in a totally hopeless environment you can still generate hope. The message is that what many call the looming water crisis is not inevitable. There are solutions, and it all depends on human ingenuity. It all depends on us, he said. Last year, Verheggen, a cultural ambassador for UNESCO, erected a huge sculpture on an iceberg off the coast of Greenland, an area he has visited annually for many years. It was the struggle of the indigenous Inuits to cope with extreme temperatures and shrinking ice that prompted thoughts of building an ice-making piece of art in the desert. The climate changes: From deciduous forest to frozen tundra in less than 100 years. This isn't some climate model, it is history. agreed but then it would no longer be of artistic quality/shape and just shows the inefficiency of the process, dune anyone?